The Biscuter was the most successful of Spanish microcars, and by the mid 1950's several thousand were swarming around the countryside. That maker was the visionary aircraft designer Gabriel Voisin, who conceived the Biscooter in France as a minimal vehicle for the common man to be run at the lowest possible cost. 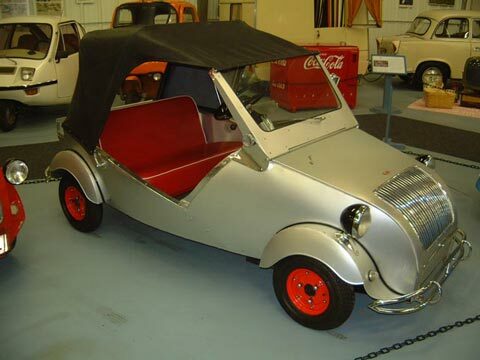 Unable to sell his spartan car in France, he gave the license to build it to Autonacional S.A. In June 1953, he traveled to Barcelona to oversee production arrangements, and the car made its debut that year at the Feira de Muestras, the large industrial fair in that city. With slightly redesigned minimal bodywork incorporating bumpers, the engine changed for a Hispano-Villiers driving the right front wheel, no reverse gear, and brakes on the transmission and rear wheels only, the car was unique amongst its contemporaries. It soon got the nickname Zapatilla, for the open-heeled slippers worn by peasants. The popular name combined with a spate of test runs up mountain passes and on racetracks, earned it a place in the hearts of the people. The first model, with aluminum bodywork, was the 100, produced in three series. By 1957 the car, now steel-bodied and called 200, was available with doors and side windows, a reverse gear, and an electric starter. By 1960, sales had fallen off sharply, due to the incursion of the Spanish-built Fiats by SEAT, and the vast majority of Biscuters were scrapped. This car, restored in Spain, is one of the few remaining examples. It is one of the later steel-bodied 200-A models.